This work is registered in the archives of the Calder Foundation, New York, under application number A07397. “It is a little hot-jazz tune, unique and ephemeral, like the sky, like the morning. If you missed it, it is lost forever. Valéry said the sea is always beginning over again. One of Calder's objects is like the sea and equally spellbinding: always beginning over again, always new. A passing glance is not enough; you must live with it, be bewitched by it. Then the imagination revels in these pure, interchanging forms, at once free and rule-governed." (Jean-Paul Sartre, "Les Mobiles de Calder," in Exh. Cat., Paris, Galerie Louis Carré, Alexander Calder: Mobiles, Stabiles, Constellations, 1946, pp. 9 - 19, translation by Chris Turner, The Aftermath of War: Jean-Paul Sartre, Calcutta, 2008) Fourteen Black Spots is a significant example of Alexander Calder’s artistic investigations. Built in 1952, the hanging mobile consists of a delicately balanced system of black metal elements suspended from the ceiling and supported by a wire structure. The mobile comes to life with the slightest breath of air, thus setting a whole mechanism in motion. Not only does it play with space, but it is also in dialogue with time. As the mobile moves constantly, it changes its positions. The appearance of the sculpture is therefore ephemeral and goes beyond the control of its creator. 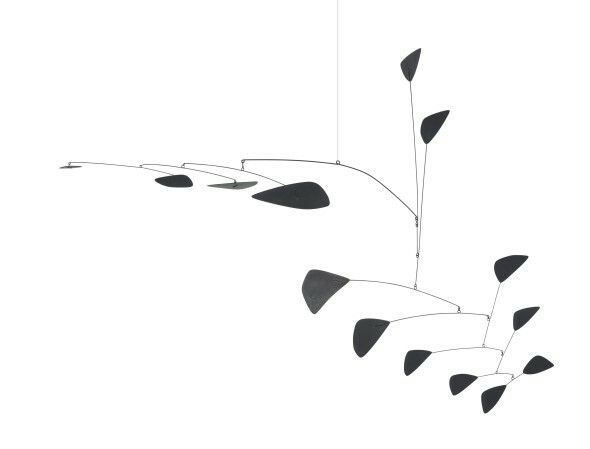 Calder is primarily known for changing our idea of sculpture and as a pioneer of Kinetic art. The artist paved the way for a new type of art that Marcel Duchamp characterized as ‘mobile’ in 1931. The artist’s creations are free from the restraints of immobility and inhabit the space they are surrounded by. It is through his works that Calder testifies his (but more generally the avant-gardes’) fascination with dynamism and motion. The artist began making mobiles in the early 1930s after he had moved to Paris and was looking for a suitable way of translating the Modernists’ abstraction in painting into three-dimensional space. It was a visit to Piet Mondrian’s studio that inspired the young American; he was resolute to apply the same geometric abstraction to sculpture. After that fortunate encounter, Calder began to realize his spatial compositions, of which the present work is a remarkable example. Calder came from a family of established artists, however he graduated in 1922 in mechanical engineering, only later did he study painting at the Art Students League of New York. This double disposition - the rigorous training as engineer on one side and the vocation towards art on the other – is reflected in his mobiles and the work in question here illustrates it perfectly. His hanging mobiles are a combination of his excellent technical skills and his imaginative genius.